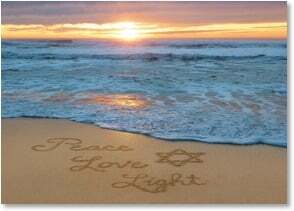 Hanukkah Card: Peace Love Light w/ May all that is good fill your world. Leaning Tree is America’s favorite greeting card that are beautifully crafted and feature original artwork by outstanding independent artists from across the country and around the world. May all that is good fill your world. Inside:May all that is good fill your world at Hanukkah and always. Save 15% on your first order! When you sign up for exclusive email offers. Leaning Tree is America’s favorite greeting card that are beautifully crafted and feature original artwork by outstanding independent artists from across the country and around the world. All our cards are created, produced and shipped from our facility in beautiful Boulder, Colorado. We strongly believe in supporting our community, our neighbors, and our customers. As for the people behind the products, Leanin’ Tree’s heritage and workforce is truly special. Tagged card, greeting, Hanukkah, holiday, light, Love, peace.